A well-fitted bosal, custom-braided by Guy Murphy. 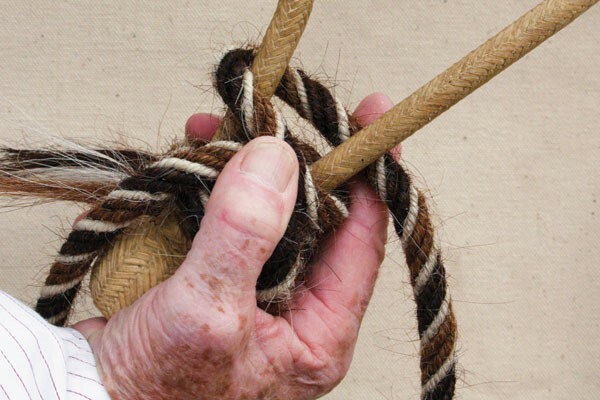 A mecate (meh COT eh) is a rein made of a single length of rope, about 20–25 feet long, usually of twisted horsehair. Mecates are used on hackamores and snaffle bits. The bosal (bow SAL) is carried on the horse’s head by a headstall, sometimes called a bosal hanger or, more often, a hackamore. 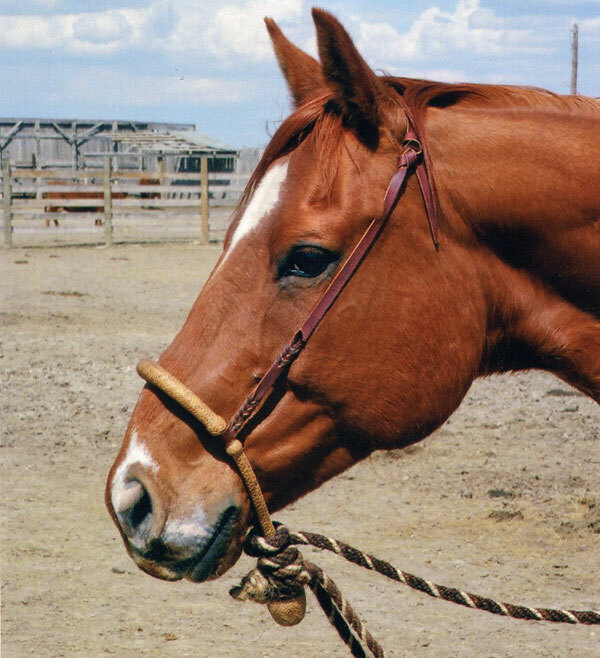 Once attached properly, the mecate has both a looped rein that comes up from the top of the bosal, and a length of rein that comes out from the bottom of the bosal. The end is tucked into your side belt loop and is used as a lead rope. 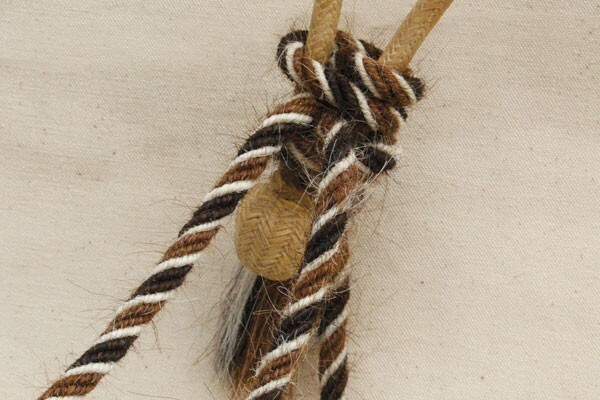 The knot used to attach the mecate to a hackamore is also used to adjust the size of the hackamore noseband by taking more or less wraps of the mecate around the base of the noseband just in front of the heel knot. The bosal is ridden with two hands, and uses direct pressure, rather than leverage.It is particularly useful for encouraging flexion and softness in the young horse. Bosals are intended for use by experienced trainers and should be used with caution by beginners, as they can be harsh in the wrong hands. 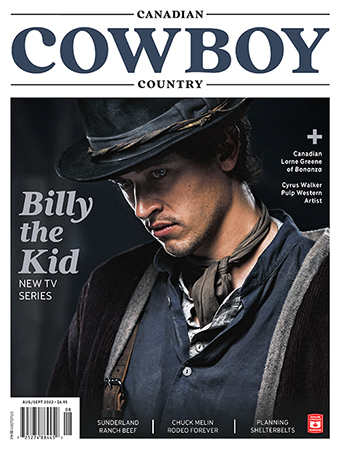 Hold the bosal in front of you in the same position you’d hold it to put it on a horse. 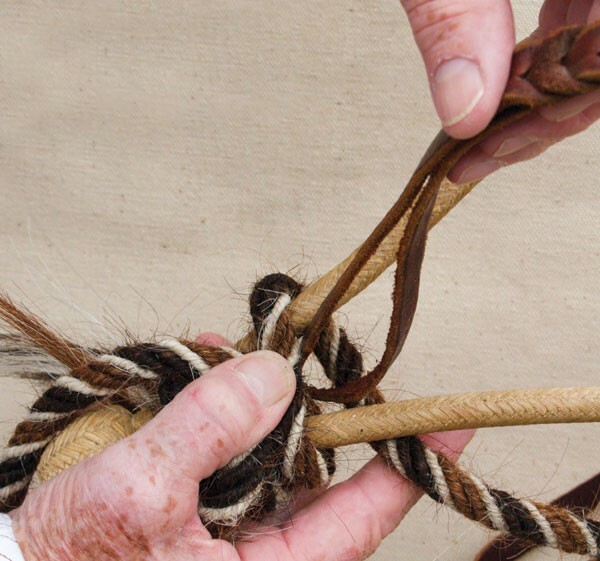 Lay the mecate across the bosal heel knot so the knot in mecate ends up under the bosal. Begin wrapping the mecate around the base of the bosal just in front of the heel knot. Wrap in counter-clockwise rotation so the tail of the mecate will come out on the left side of the horse when you’re finished. Make as many wraps as you need to fit your horse. It’s trial and error at first so you may need to add or remove a wrap before use. When you have finished wrapping, pull the rein loop through the noseband from underneath about as far as you can spread your arms. Now hold the rein loop in place on the bosal with your hand and make a half hitch around the complete bosal with the tail end of the mecate. Thread the end of the lead line (with leather thong) through to complete the half hitch. Pull the half hitch down snug with the tail of the mecate. 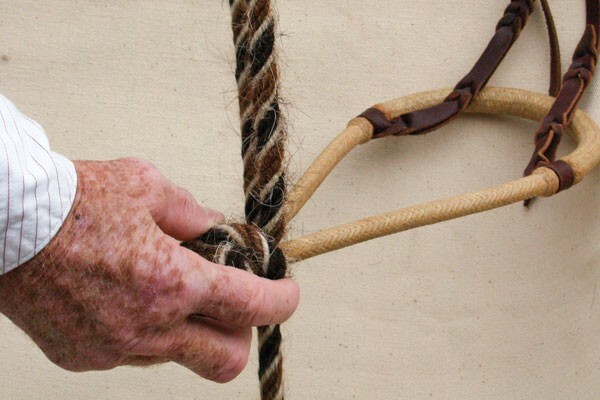 Pull each end of the rein loop snug. 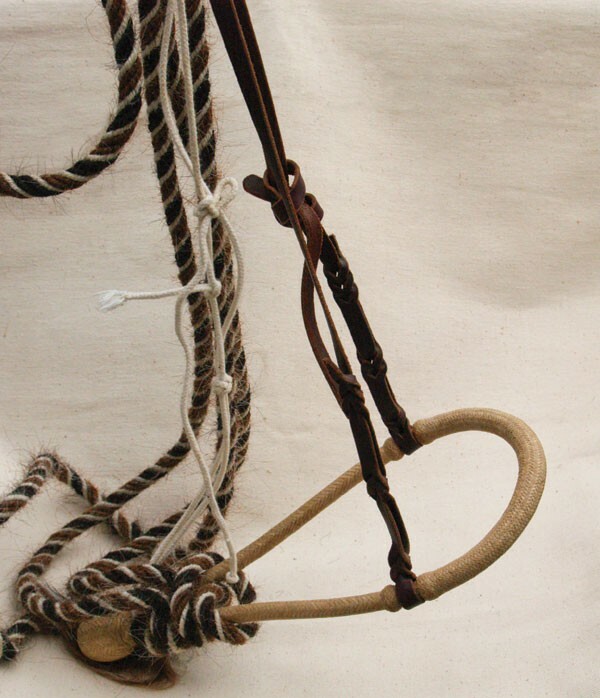 After use, hang your bosal as above; with the reins and lead loose enough so that the heel knot hangs down.